Author(s): Ketan P. Gattu, Kalyani Ghule, Anil A. Kashale, R.S. Mane, Ramphal Sharma, D.M. Phase, S.H. Han, Anil Vithal Ghule. Department of Nanotechnology, Dr. Babasaheb Ambedkar Marathwada University, Aurangabad 431004, Maharashtra, India. Tin oxide (SnO2) nanoparticles are prepared by simple and cost-effective biosynthesis method, wherein, tin chloride (SnCl4) reacts with Bengal gram bean (Cicer arietinum L.) extract. The assynthesized SnO2 nanoparticles were coated onto the glass substrates using doctor blade method to form thin films. The films were further annealed at 250°C and used for characterization and gas sensing applications. Alternatively, the SnO2 nanoparticles were biosynthesized using carbohydrate (starch) and also by chemical precipitation method. A comparative study of structural and morphological properties of chemical and biosynthesized SnO2 nanoparticles is also carried out. Further, room temperature ammonia gas sensing properties of the biosynthesized SnO2 nanoparticles thin films are studied. Keywords: Biosynthesis, electron microscopy, nanostructures, oxides, sensors. Affiliation:Department of Nanotechnology, Dr. Babasaheb Ambedkar Marathwada University, Aurangabad 431004, Maharashtra, India. Keywords:Biosynthesis, electron microscopy, nanostructures, oxides, sensors. Abstract:Tin oxide (SnO2) nanoparticles are prepared by simple and cost-effective biosynthesis method, wherein, tin chloride (SnCl4) reacts with Bengal gram bean (Cicer arietinum L.) extract. The assynthesized SnO2 nanoparticles were coated onto the glass substrates using doctor blade method to form thin films. The films were further annealed at 250°C and used for characterization and gas sensing applications. Alternatively, the SnO2 nanoparticles were biosynthesized using carbohydrate (starch) and also by chemical precipitation method. A comparative study of structural and morphological properties of chemical and biosynthesized SnO2 nanoparticles is also carried out. 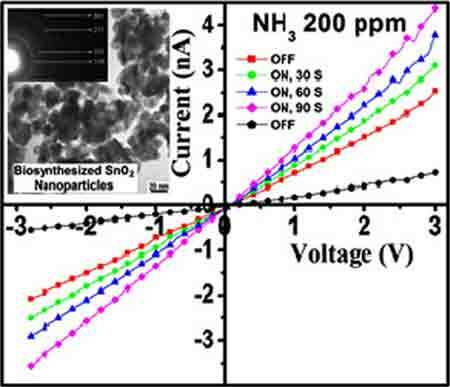 Further, room temperature ammonia gas sensing properties of the biosynthesized SnO2 nanoparticles thin films are studied.